Thanks to Heather at Flour Girl, there’s a new group that’s all about cooking with CSA goods. Since I’m always going on about my CSA, I had to join. My most recent pick-up from Hands of the Earth Farm included eggplant, cherry tomatoes, regular tomatoes, zucchini, pattypan squash, and yellow squash along with some chiles, onions, and edamame on the stem. There were two baby-sized Japanese eggplants and one small one of the Mediterranean variety. I had an idea of how I wanted to use them, but I wasn’t sure how well it would work given their diminutive size. This dish is found in Vegetable Harvest by Particia Wells. It’s a compacted mini-terrine of sorts with eggplant, roasted cherry tomatoes, goat cheese, fresh basil leaves, and basil oil, and it screams summer from the plate. This recipe requires that a couple of items be prepared in advance. That adds to the overall time of an otherwise very simple dish, but these steps are well worth the additional effort. One of those items is basil oil, and this is the same basil oil I posted about last October. It’s a great use of abundant homegrown basil, and the oil can be kept refrigerated and used for 10 days. The other extra step is roasting cherry tomatoes, but if you know how delicious those are then you know this step is not only justified but necessary. 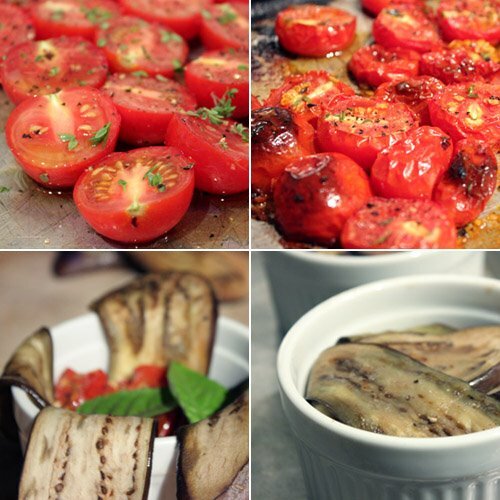 So, once you have the basil oil and roasted cherry tomatoes, all you have to do is broil long, thin slices of eggplant and begin layering. The cooked eggplant pieces were used to line ramekins while partially overhanging the top edges. A few roasted cherry tomatoes were set on top of the eggplant in the ramekins, then a couple of basil leaves were placed on the tomatoes, then some goat cheese was pressed on the basil, more basil went on the cheese, and then the overhanging eggplant was folded in and pressed into place. The timbales could be prepared up to this point in advance. The ramekins were then placed under the broiler for a few minutes to heat through. Thankfully, the timbales popped right out of the ramekins without any problems and were served with basil oil and some chopped basil leaves. It’s a simple combination that could be put together a thousand other ways, but the compacted timbales had a nice, presentable look about them for the most part. Mine were somewhat short and squat and lacked complete eggplant coverage in some spots due to the size of eggplant I used. I’d like to make this again with full-sized specimens now that I know how simple it is. There are only a few ingredients used here, but they combine perfectly into tasty, little savory packages with the added boosts of flavor from the roasted tomatoes and basil oil. I always try to make good use of everything from our CSA, and I was happy with this result. Next, I’ll be searching high and low through books and files for zucchini recipes for what’s sure to be a deluge. Oh wow! This looks HEAVENLY! totally gourmet...I'm really impressed, Lisa! 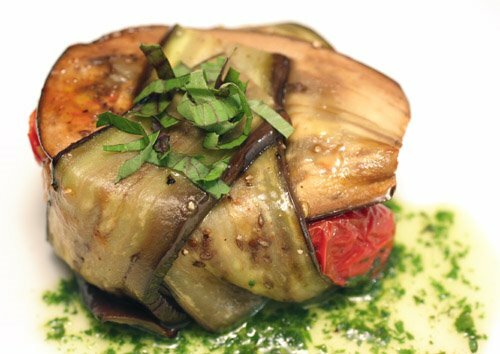 Aren't you very talented and very clever Lisa ... your eggplant timbale look so delectable! All of my very favorite ingredients. I made Japanese eggplants tonight. I will check out that CSA club, sounds great! Beautiful photos, as always! Nicely done. Simple ingredients in an lovely presentation. I love it. it looks fancy and elegant..I bet it taste absolutely divine! Wow, this is a great recipe for all those fresh summer ingredients. I am heading to my friends' CSA on Thursday morning to pick up her goodies while she's away on vacation. can't wait to see if they've got these eggplants. Absolutely beautiful! And it sounds delicious! And like something I would totally love to eat. So gorgeous!! I'm completely impressed (again!)! And, they look absolutely delicious. Can't wait to see what you do with the rest of your CSA ingredients this summer. I made that same recipe last summer. Classic Patricia Welles - doesn't seem like much until you taste it and then WOW! I didn't try to unmold mine - we just ate out of the ramekin. This looks much prettier so I will try that next time. Glad to know they pop out! looks like there is no place for the flavor to hide - I bet these tasted great because they sure do look good! Perfect for the summer days! A delicious creation! Love eggplants, and the Japanese ones are more tender...yummie, like the way that you prepare it. Tomatoes, basil, and cheese, looks delicious. Yummie! Wow!!!! That first picture is AMAZING! 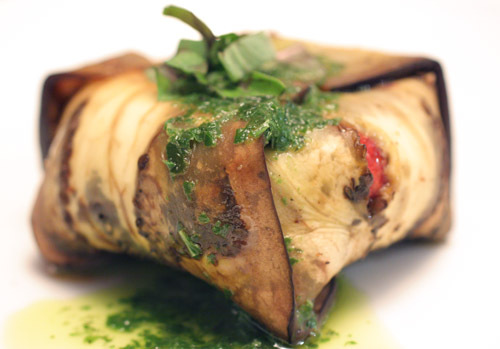 I LOVE eggplants, I absolutely need to try this dish! Now I wish my favorite Mediterranean haunt was still open here in town, I would go tonight and scarf down some stuffed eggplant, since you have so put the thought into my mind with this lovely dish! The presentation of these would be great for a party. Love the goat cheese with tomatoes. This looks beautiful and sounds like it would be delicious. Great job!! Wow, these sound delicious. Never heard of basil oil before. Great presentation and photo. A very clever dish, perfectly executed and delicious looking! Wow! Those are beautiful. And so creative, too! Just stunning. Thanks for joining "Cooking Away My CSA!" wow! those look so good. i keep on mining to sign up for a CSA, and forget every spring. i need to do it next year. btw, i keep thinking about your papaya bread.. This is a delicious presentation. Looks yummy. What a great and interesting combination! The wrap looks awesome too! I have never made timbales, they are lovely. Sounds easy to. Lisa, these look fab, sound delish and I would order this in a restaurant! What delicious little eggplant packages. I'm sure their just loaded with flavor - especially with the roasting of the tomatoes! What a beautiful and healthy looking dish! Those roasted tomato filling must be the umami bomb. That is gorgeous! Love your first shot! Such a delicate looking dish! The first pic is just stunning! A real feast for the eyes! I love stuffed aubergine timbales! They look so georgous & lovely! What a lovely meal for a nice & hot summers day,...MMMMMMMMMMMM...!!! WoW so beautifully done. I love the way you have wrapped it so pretty & neat. Very impressive! Looks far from simple too. I've never heard of timbales - very tempted to try your recipe though!